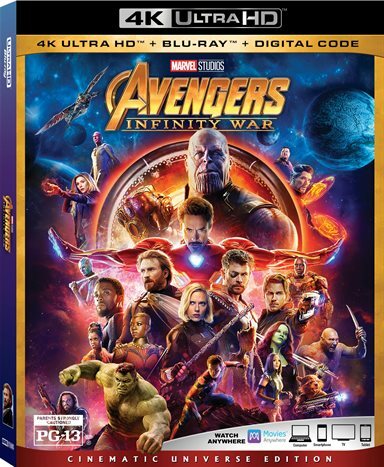 You would be crazy not to own a copy of Avengers: Infinity War on 4K! It's been ten years and 18 films in the making. Avengers: Infinity War was one of the most anticipated movies of the Spring 2018 and depending on who you ask, it didn't disappoint. It brought together over 20 Marvel superhero characters and melded all their worlds into the fight to end all fights…the fight for the universe and half of all its inhabitants. For 2 and a half hours it enthralled fans and mesmerized audiences as the Avengers teamed up to fight Thanos (Josh Brolin; Sicario) in order to prevent him from destroying the universe. Unfortunately, that didn't seem to happen leaving fans in mourning and wondering what happens next. While we will have to wait until next year for the answer, we can once again enjoy Avengers Infinity War over again as it makes its way to home video release on 4K, Blu-ray, DVD and Digital download. Thanos sees himself as a savior. He knows that in order to save the world he needs to obliterate half the Universe's population. In his quest to do so he needs the infinity stones – six stones that control various components and when used in conjunction make the user invincible, even against superheroes and gods. As he wanders the Universe in search of the stones he leaves a wave of destruction in his path. He also encounters the Avengers. First he battles Loki (Tom Hiddleston; The Night Manager), The Hulk (Marc Ruffalo: Spotlight) and Thor (Chris Hemsworth; Snow White and the Huntsman), then he takes on Iron Man (Robert Downey, Jr.; Sherlock Holmes) and Dr. Strange (Benedict Cumberbatch; The Imitation Game). Eventually, the Guardians of the Galaxy are thrown into the mix and everyone eventually ends up in Wakanda fighting for their lives. However, this giant monster seems to be unstoppable and things don't end as well as we are used to seeing in our superhero movies. You have to wonder what kind of budget it takes to get almost 30 major movie stars in one film that includes special effects and various location shoots. You also have to wonder the amount of coordination it took to pull off making a movie of this scope. The results, however, are excellent. Bringing together characters from all over the Marvel University and melding them together to try and defeat a common enemy had fans excited and anxiously anticipating the movie's release. The results paid off as Avengers: Infinity War grossed $250 million in its opening weekend. A film like this is ripe for a 4K release and the movie doesn't disappoint. The 2160p video quality is sharp and clean with true reds, deep blacks, and lush greens. The details are easily seen and appreciated as they could have easily been missed in making such a large scale film. The Dolby Atmos audio is the perfect complement to the video as dialogue is clear if slightly low. The Combo pack comes with some great extras including an Introduction from the Directors, Joe and Anthony Russo, Strange Alchemy which looks at bringing together these unique Characters from the Marvel Universe, The Mad Titan focusing on Thanos, Beyond the Battle: Titan and Beyond the Battle: Wakanda that looks at these locations in very different ways, Deleted scenes, gag reel and audio commentary. While not terribly long these snippets offer some interesting insights from cast and crew interviews. Avengers: Infinity War is an epic film showcasing an equally epic battle that doesn't end the way most movies do. Perhaps that was some of the criticism when the film first came out as fans were shocked and a little disappointed at the outcome. However, it is obvious this story isn't over so we will wait until the sequel arrives in theaters. In the meantime, you would be crazy not to buy your own copy of this movie to watch over and over again. Download Avengers: Infinity War from the iTunes Store in Digial HD. For more information about Avengers: Infinity War visit the FlickDirect Movie Database.